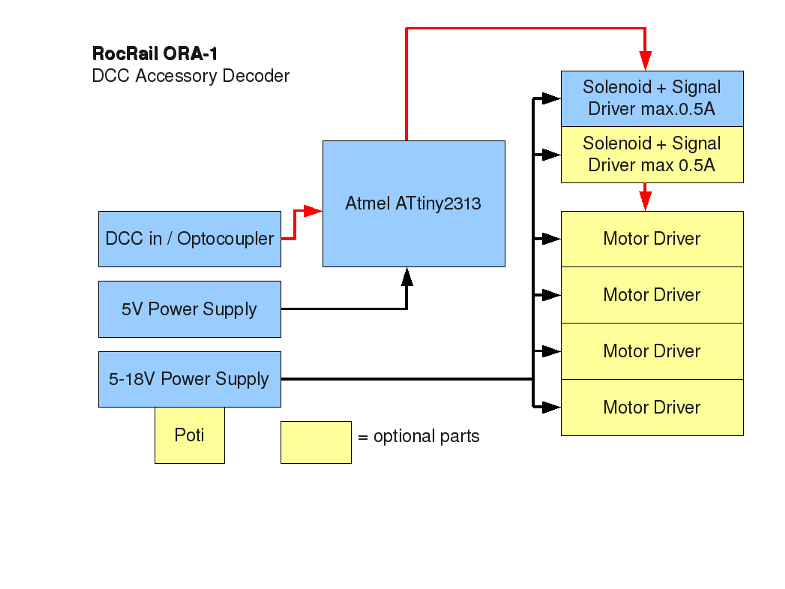 ORA-1 is een multi purpose accessory decoder. Hij kan in twee versies gebouwd worden; één versie voor wissels aangedreven met magneetspoelen en een tweede versie voor servomotor aangedreven wissels. ORA-1 is gebasserd op en compatibel met Opendecoder. Veel dank aan Wolfgang Kufer en zijn OpenDCC project. Schema en de print zijn ontworpen met KiCad, een Open Source (GPL) PCB omgeving. Alle CAD bestanden zijn beschikbaar RocRail Subversion repository. Versie 1 kan gebouwd worden met één of twee maal ULN2803 driver chips. Iedere ULN2803 geeft 0,5A max. piek vermogen. Voor kleine schalen zoals N of TT, kan één ULN2803 genoeg zijn, voor HO is het beter de ORA-1 met twee chips uit te rusten. .
For building the Version 2 Hardware you need all parts used in Version 1 plus the parts below. You need only one ULN2803 because of the BD678 booster circuits. 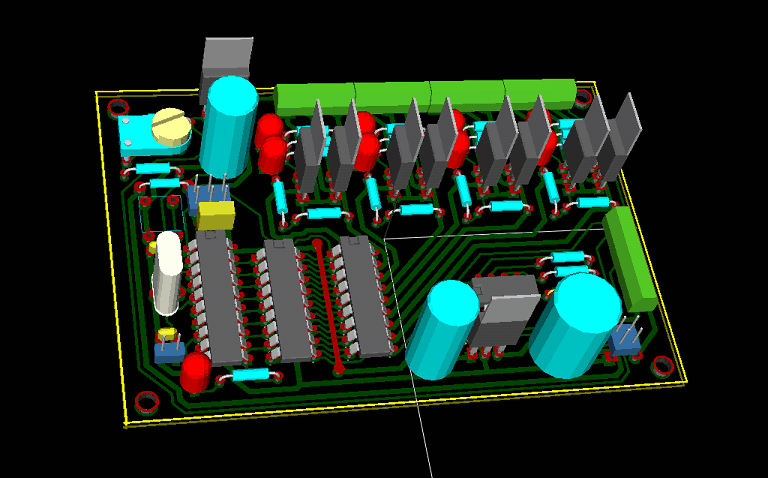 The Heatsink is not a must but a small Heatsink is better as a burned LM317 Remember that you need a M3 screw for it. Instead of the BD678 PNP Darlingtons you can use any PNP types who are able to drive 1A. If you use non Darlington Transistors you have to replace the 5k6 resistors with 1k5 types. Mount the jumper near U2. Mount all resistors and diodes. If you use a 6N137 opto you have to mount R2, if you use a 6N136 leave R2 empty. Mount all IC Sockets. If you build the 0.5A Version mount sockets for U1, U2 and OK1. If you need 1A you have to mount U3 too. Mount the power supply, elko's and the connectors. Test - If you press the sw1 button longer than 100msec, LED2 will light up. Mount all IC Sockets. Remember that you don't need to mount U3 for driving motors. Mount the PNP Transistors, the power supply, elko's and the connectors. 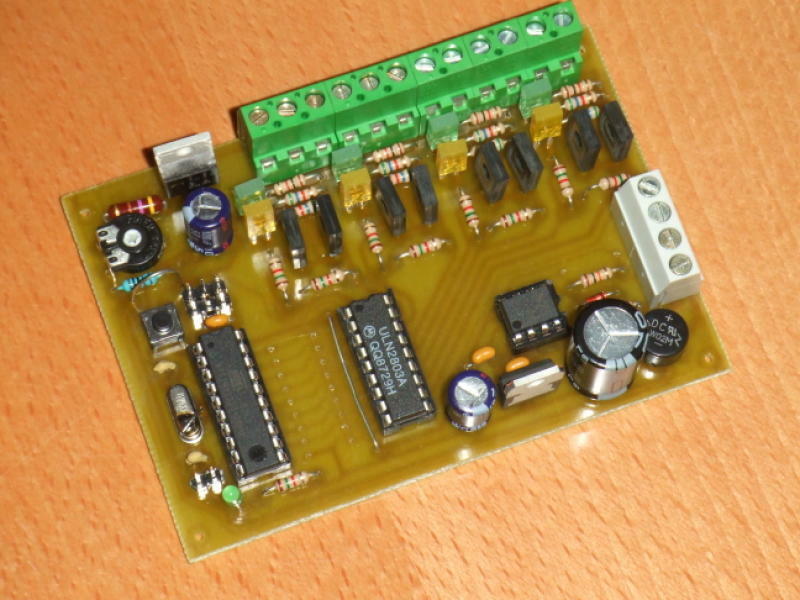 Connect power and check +5V and VAA after the LM317. Test the Poti and measure the output voltage. 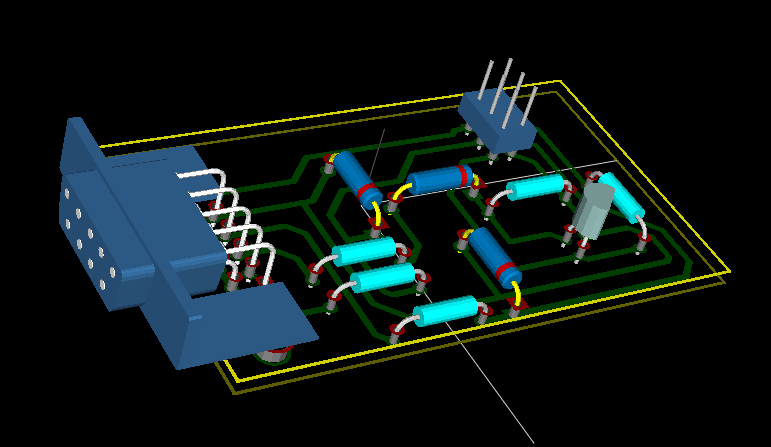 AVR programming is quite easy. You need a programming software and a small hardware adapter for the serial port. We suggest to use Ponyprog2000 . The programming hardware is really small. You only need 4 resistors, 2 zener diodes, 1 transistor and two connectors. You may build it on a breadboard but for the more enthusiastic model railroader i prepared a small Layout. Status: Works fine. Dsub9 layout can be improved. 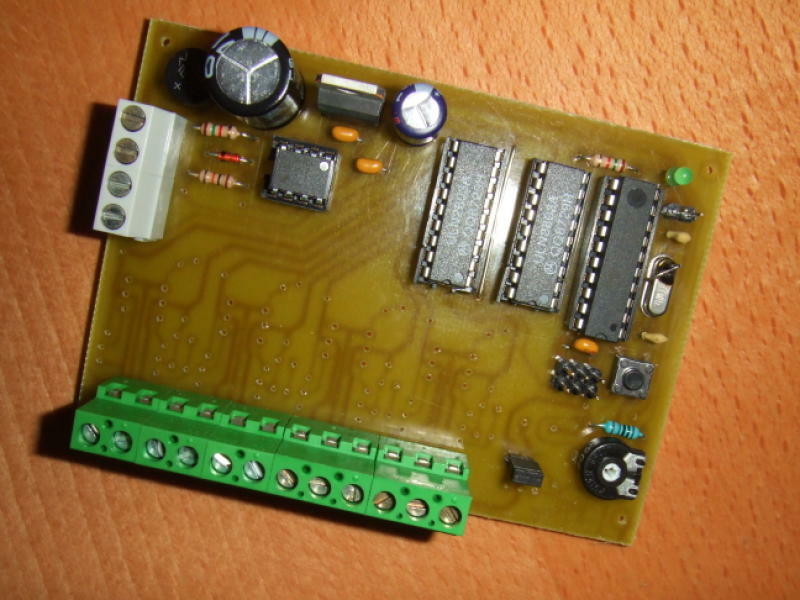 You also need a 1-to-1 cable to connect the 6 pin connector at your decoder with the 6 pin connector at the programmer board. First you have to setup the pic programmer. 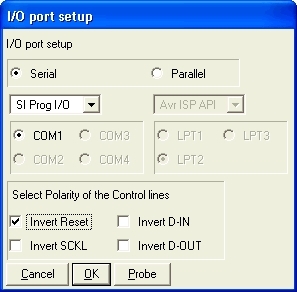 If you use the programming hardware described above you have to setup Ponyprog this way: Click on "Setup/Interface Setup" and setup the I/O Port as you can see in the picture below. Attention: If you are using ORA-1 with 10k Pullup at reset input, don't check "Invert Reset" !!! You have to tell Ponyprog the name of the device you want to program. Click at "Device / AVR micro / ATtiny2313"
Finalize by using "Write" to download the fuses to your decoder. 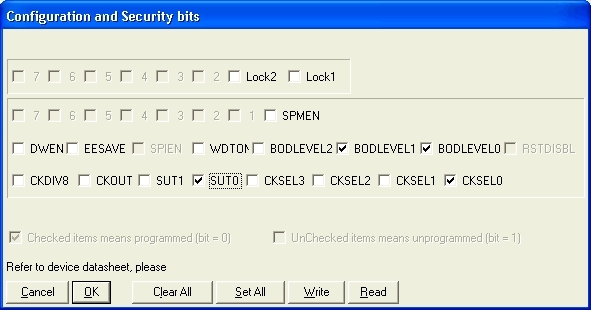 Afterwards you have to open the EEprom and the Program files. Click on "File / Open Program (FLASH) File …" and select the OpenDecoder10MHz.hex file at the place where you unziped it. Now click on "File / Open Data (EEPROM) File …" and select the OpenDecoder_10MHz.eep file. If both files are successfully loaded you have to click on "Command / Write Program (FLASH)" and after that is done click on "Command / Write Data (EEPROM)"
Now the chip is ready to test: connect power to ORA-1. Press the button at the ORA-1 board. The LED will light and displays that ORA-1 is in programming mode. Disconnect power and be happy, your ora-1 works. Connect your 12-18V AC Model Train Transformer to P3, connect the DCC signal cables with P2. It is also possible to bridge P2 and P3 and get both, Power and DCC from the tracks. Connect your Turnouts to screw 1 to 3 of every Connector K1 to K4. Screw 1 is the green output, screw 3 is the red one. Screw 2 is Power (black cable at most turnouts). Connect your Motors to screw 1 and 3 of every Connector K1 to K4.ORA-1 is geschikt voor motoren van 5-18Volt DC. Gebruik van mode 3, zie onderstaand. 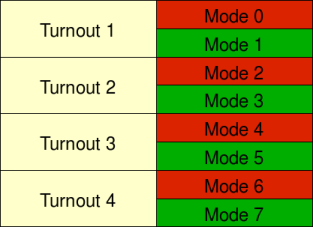 You can select the mode when sending a turnout command while ORA-1 is in programming mode. To enter programming mode press the button at ora-1. LED D2 will Light to indikate programming mode. Select the mode by sending the according turnout command. After ORA-1 received the DCC Command LED D2 will be off. You want to setup ORA-1 for your motor driven turnouts No. 13 to 16. Mode 3 is the right one for motor turnouts. So you have to send a DCC command to the "green" output of Turnout 2 of this ORA-1 board. Turnout 14 equals Turnout 2 at the 4th ORA-1 board (every board is able to power 4 turnouts). To setup ORA-1 send the DCC command for the green output at Turnout No. 14. Picture of the prototype ORA-1 assembled with all the parts needed for motor switches.